Other pages show residents and their projects in 2018, 2017, 2016, 2014 , 2012 and 2013 and 2004-2011. Lindert Paulussen (Belgium) is an amazingly successful young painter. He was awarded already several times. Nevertheless his painting is first of all the result of his other passion: adventure. He makes night walks to encounter wild boars and climbs trees to see the eggs in an eagles nest. 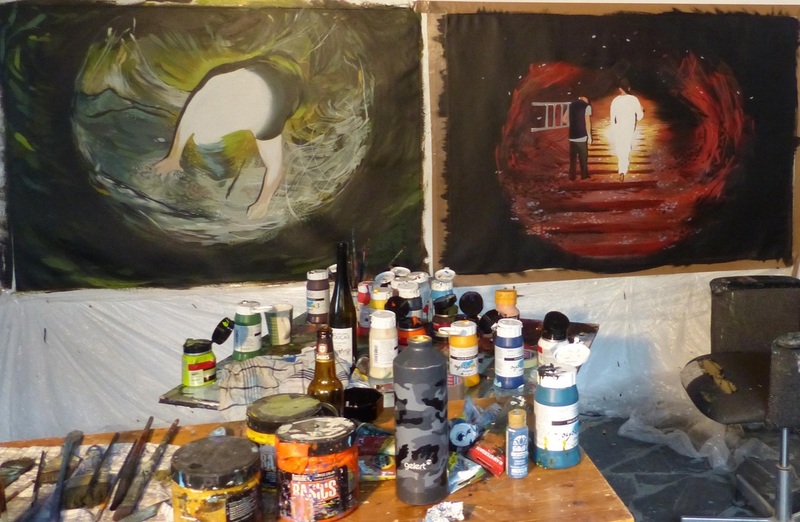 These adventures, in combination with his artistic skills, make his painting extremely powerful. And spooky. At the moment he makes a series of night scenes with an overexposed spot. You get a feel of what might be happening, but due to too much light in the spot and to little light in the surroundings you only can guess. Rachel Back (Israel) worked on a long poem, both dramatic and sensitive, on the guilt that a mother feels when letting her son leave for the war. Everybody was moved when she read it. She also wrote thirteen short, playful poems, for which she was inspired by Emily Dickinson (1830-1886) who wrote intriguing short poems on used envelops. Sherry Wiggins (USA) came to work on a project that was deeply inspired by Elena Almeida, a Portuguese artist and feminist who in the 1970th made photo collages of herself dressed in black, to which she added blue patches. Also Sherry made photos of herself dressed in black: in some case covering herself and her surroundings with black tissue, in other cases laying in a black and red circle. But different from Elena Almeida, for Sherry the environment was crucial: she did her photo shoots on an excavation site and on the rooftop of a fortress. Apart from her artwork Sherry has a very personal vision on artistic ownership: she emphasizes that she walks in the footsteps of an artist that she admires. She does not desperately try to be completely unique in subject and style. And just this modesty makes her artship unique. Sherry was assisted by Luís Branco and Rui Fernandes, a professional photographer and cameraman, respectively. See Sherrys´blog for more info (including a spectacular drone video). Sydney Payton (USA) is curator by profession. She was director of a contemporary arts museum, curated dozens of exhibitions and wrote many essays on artists. It was not surprising that her suggestions and advises towards other residents were highly appreciated: they were to-the-point, adequate and productive. But she took a residency to work on “The Weight of Dreams”, a novel about a young adult who lives in the community of native Indians in New Mexico. She encounters both the great shifts in American culture in the 70th as well as the mysticism of the Indians. The story is full of spirituality and the wording is very poetic. Akiko Wakayama (Japan) was especially inspired by the Portuguese tiles. She studied the patterns and scenes in churches and public buildings, and then covered the walls of her studio with her “tiles”. She used photo sensitive paper, transparent sheets and packing paper, and cut it in squares of 10x10 cm. Her drawings reflected her fascination for nature, her moods and her dreams, as well as her Japanese roots. In August 2018 Akiko exhibited part of her work in Berlin . Although it was a group exhibition one of her works was chosen to highlight the whole show: an impressive tableau of paper tiles, depicting the nature of Evoramonte, including the fortress of Evoramonte and our cats. Akiko got inspired by the azulejo walls of Convento São Paulo in Redondo. The slide show gives an impression. Phil Moody (USA) came for the second time, this year. He gave a huge boost to the project that he started in June: to make photo portraits of workers in the marble quarries. Very exceptional was that Phil got permission to make a documentary of workers deep in a marble quarry of Estremoz. He intends making some ten 2x2m photo mosaics and hopes to exhibit these in 2016 or 2017 in the Palacio de Dom Manuel in Évora. In addition he wants to make a book where these images are combined with information on marble: the history, geology, economy and especially the life of the workers. For this he wants have workers interviewed. He made already his first interview: with a retired employee who started when he was ten by bringing water to the workers with a donkey, and ended his career as a globally operating marble seller. 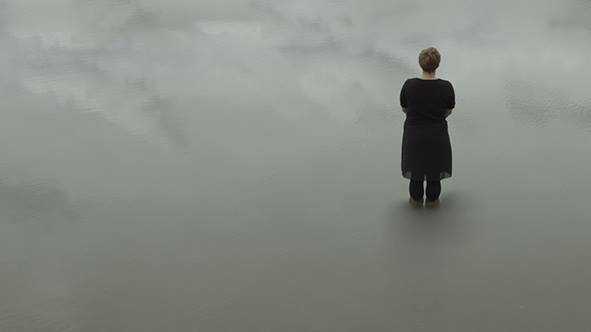 Noortje Haegens (Holland) made a series of short videos of details in the landscape or of herself experiencing the environment. All were minimalistic and meditative. One video showed her feet while walking over a rocky surface,clearly suggesting the pain that she step-wise must have felt. Another video showed a rippling water surface that, after it became windless, turned into a mirror showing the cloudy sky. Several other videos showed the same kind of unusual perception of reality. Noortje requested Eva Nijsten (Holland), a professional camera woman, to come over for making specific video recordings. The result of this collaboration was of amazingly high quality. Both from the artistic and the technical point of view. André Marques (Portugal) is a highly talented filmmaker. He was working on Brothers, an experimental documentary on people who live on the streets of megacities. As most of the shootings were done with a hidden camera it feels uneasy. But you also feel a deep compassion with them, even although it is unclear whether these people are losers, victims or survivors. André was also working on another movie. A short version of this movie is currently being screened on several film festivals. It is about women trafficking. OBRAS got a preview: . it impressed all residents deeply. Paola Lopreiato (Italy) is video artist and performer. Her focus is on the interface between reality and the mental space: how we create memories, how perception influences our mood, how our senses mediate the relation between reality and inner truth. Thereby she uses her own experiences. On 11 September she did an impressive performance: Parts and Pieces, in which she built between her and the audience a wall of sacs with hay. Thereby she blocked the video projection with snapshots of her recent past. Later she destroyed the wall and shared her feelings with the audience by slowly taking off her headscarf. The slideshow at the right side gives an impression of the preparation and the performance it self. Elena Cheah (USA, currently living in Germany) and Raphaelle Oskar (Croatia, currently also living in Germany) worked on an musical theater piece. IT IS OK is the working title. It is about a boy who discovers that his parents hide secrets of existential level for both the parents and him. A deeper layer in the piece is a criticism on the current time spirit in the Western world: that you are special, that you must be and feel special. To tell more about the piece would reveal too much of the plot. Better go and see it, probably first in Berlin. We will announce it as soon as there are more details to tell. We saw the try out and everybody was deeply moved. The fantastic playing of Elena on her cello (and reading some of her poetic introvert texts) was the perfect complementary mix with the flamboyant acting of Raphaelle with her humor, big gestures and sometimes aggression. In the last days of their residency Raphaelle showed another talent: she made a small exhibition of the Indian ink calligraphies that she used to shape the theater piece. Also Elena gave us a big present: she played several suites of JS Bach like only few musicians can do. Matias Ringheim (Norway) showed to be a real multimedia artist: he photographed, sculpted, draw and painted. Especially his installations with found objects (marble, chips of wood, tin cans and yogurt cups) were original and beautiful. He also continued a project he worked on before. At a local marble factory he ordered small plates of polished marble in the size of a mobile phone, drilled holes in them and used them as a base for embroidery. In the previous project the scheme of holes presented words in ASCI code. In the new project they are stellar constellations. Kevin Morrow (USA) was working on a project: Diaspora. During the history of mankind individuals as well as civilizations leave their homes to find a better future. He has a specific fascination for the sea voyages of the Maoris in prehistory in search of new land. But being in Portugal he also considers Columbus who left Europe in the hope to find another continent. And in fact in his own life he is on the move as well: he has to leave Brooklyn as it has become too expensive. He hopes to find land that is fertile both for his art and for his life in general. With all this in mind he carved two boats out of wood that he found in the surrounding nature. One boat is carrying a group of people, while the other has a mast that symbolizes the evolution of mankind. Kevin considers continuing working on this subject until he has sufficient to show in an exhibition in the Castle of Evoramonte, provisionally scheduled for 2017. Flora Buberle (Switzerland) was educated as an artist and is now studying architecture. She attempts to find synergism between the two disciplines and deeply disagrees with architects who see art as an ornament that can be added once the architectural object is ready. At OBRAS she experimented with marble chips: she covered a wooden chair with it or let them seem to float in the air. Dried flowers were another material she used: fixed in a veil or glued on old postcards, or as a wig on a head. And something completely different: we have two cats. One is disabled due to an accident: he misses an eye and an ear. Flora was so kind to make an artificial ear for this poor cat: see her slideshow. At OBRAS Holland, Phyllis Odesey and Peter Mauss (both USA; garden architect and landscape architect, respectively) were studying and enjoying the Dutch urban and rural landscapes. Jonathan Roson (Australia, currently living in London) was also a resident in 2014 . His main reason to return was to make an exhibition in the Castle of Evoramonte, entitled WIRED. 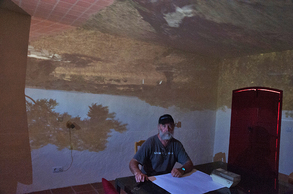 He created several site specific installations, while in contact with the visitors of the Castle, that relates to the history of the building and to the local environment. 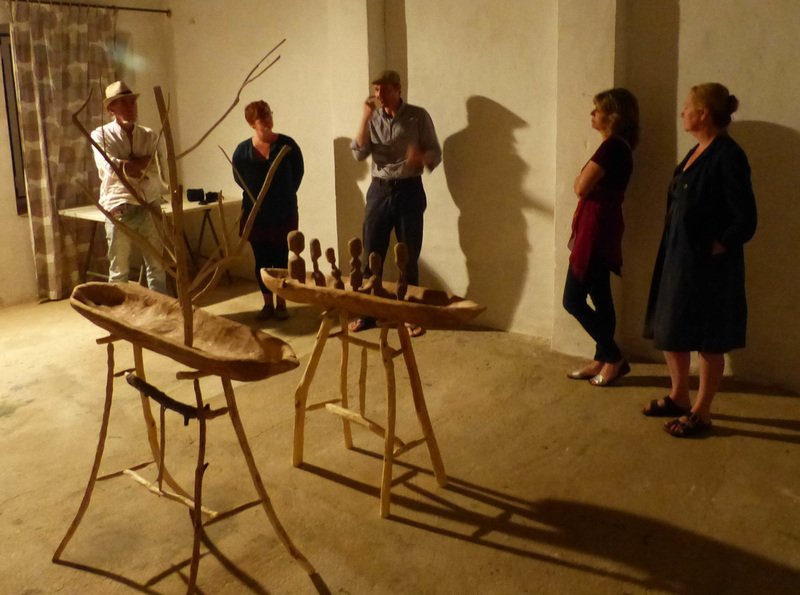 At the opening on 22 August Jonathan added the sound of wind to his installation. See this video for an impression. A second reason for Jonathan´s return was that he fall in love with the marble of Estremoz. 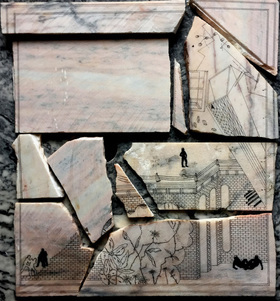 He intends creating a few new pieces and set up the logistics for transport of marble to his studio in London. Although Gerry van der Linden (Holland) is first of all a gifted poet, at OBRAS she focused on another quality: visual art. She made small installations with found objects, which together with their ironic titles triggered each others fantasy. Among other artwork she also made a video about the oak tree next to her apartment. 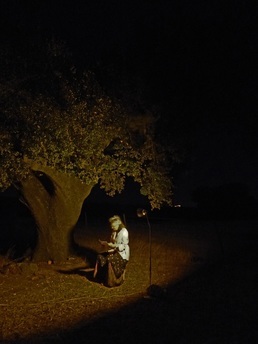 During her artist talk she projected this video on the stem of that same tree while reciting a poem on her relation with that tree. 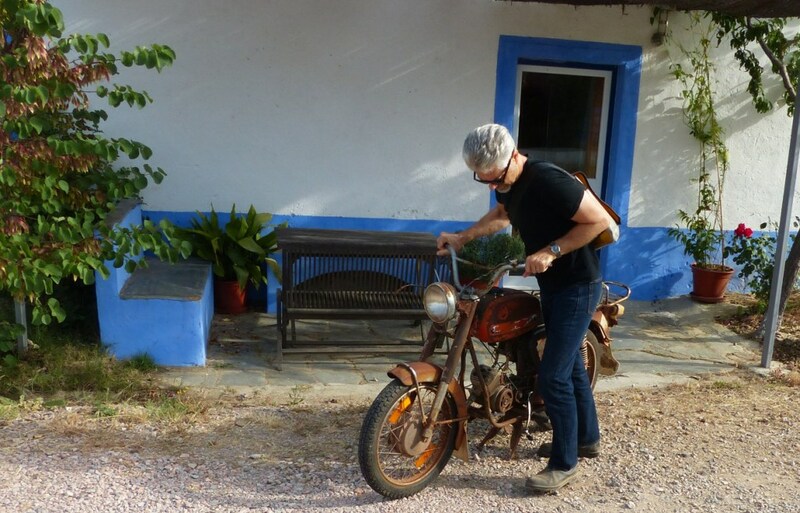 Another reason to come back was that we are working on the publication of her antology: uma estranha no Alentejo. This publication (her first in Portuguese; to be published by Caminho das Palavras) will have her poems combined with photos by Luís Branco. Dan Carlson (USA) has a fascination for the moon, or more specifically a fascination on the human, political and technological drivers to explore the moon. He carved the phases of the moon in marble and did draw oversized portraits of the dog and monkey that where the first travelers to the moon. He also made a surrealistic land art installation: he pinned LED lights on a slope of a hill in such a configuration that from downhill it looked like a stellar constellation, but under the horizon. Also spectacular was a moon floating two meters above an oat field. His work will soon be exhibited in New York. 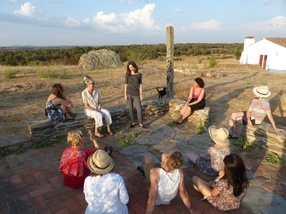 Annie Lord (UK) wanted to visit Portugal was because two years ago she wrote a short story on the cork cutters of Edinburgh in the 19th century. Another reason was to write a short story, meant to be told rather than to be read, on the ear. She started writing this story in Finland and finished in Evoramonte. The story is full of anecdotes. But it is also about the anatomy and physiology of the ear, as well as on the ear being the border between outside and inside, between body and mind, between sound and perception. Her artist talk was in the open air. She told us the full 15-minutes-story by hart. All hang on her lips and were deeply impressed. In July 2015 two former residents took care of the house, garden and cats. Nico Huijbreghts and Yvonne Halfens intended to largely use this time for holidays, but in addition they were highly productive. Nico was working on a commission: a piece for four grand pianos, was making drawings and was finishing a long, poetic essay in which each chapter was focusing on one number out of a series from 1 to 99. 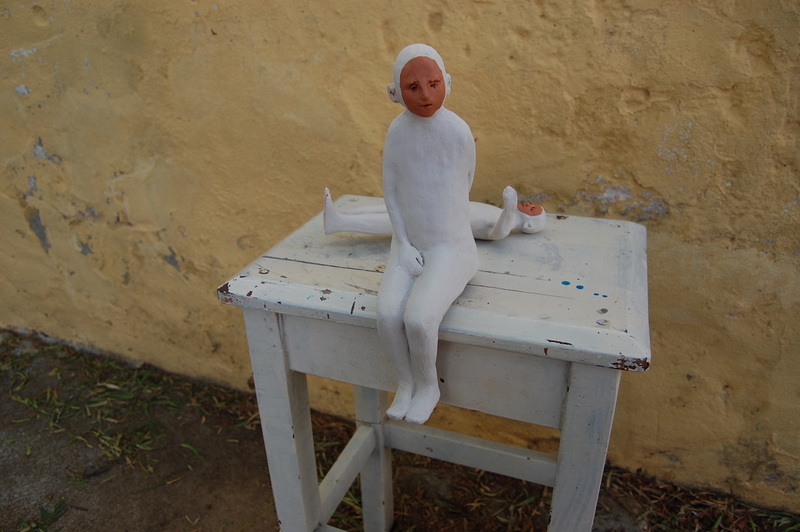 Yvonne made several highly intriguing figurines. Some look archaic, other contemporary, but all express something very personal. She described her work as a study on what it is to be a human. Nico and Yvonne invited two artist friends: Peter Bremer (visual artist) and Nora van Dam (performing artist), who also experienced the creative boost that seems typical for OBRAS. Scott Sherk (USA) made soundscapes. He collected the sounds of sheep bells, crickets, finches, vegetation at soil level and scarecrows. He manipulated them until a gentle, meditative composition had arisen. At his artist talk he impressed everybody with his presentation in the patio: We first listened en groupe when it was still light and later individually under a starry sky. Starting point for the visual art work of Pat Badt (USA) is color: she concentrates her impression of a landscape, a wall, street pavement or a window view to a series for parallel stripes, loosely painted with the help of a grid of woolen threads. The result is highly intriguing, and nearly meditative. We are now working on a proposal for a presentation in the Castle of Évoramonte in 2016: a soundscape by Scott Sherk in combination with a light installation by Pat Badt. In August Erika Dahlen (Sweden) returned. She was working on a highly prestigious commission to “convert” the space of a new to build metro-station in Stockholm into a site-specific artistic installation. Her ideas and concepts are very much a follow up of Qualia: her solo-exhibition in the Palacio de Dom Manuel in Évora in April 2014. Rachel Sherk and Aaron Rourk (New York) are partners in art and life. Their disciplines are sound and music, respectively, but their joint project was truly multimedia. They made a visual dairy of their residency: videos of one or two minutes in which they act in the surrounding landscape: seemingly spontaneous, but in fact with well prepared choreography, scenography and sound. Have a look and be amazed. During their artist talk they gave an example of how they composed a piece with a sound mixing system, starting with Aaron playing the clarinet, Rachel singing and both clanging cow bells. Anna Maria Mackowitz (Austria) made abstract paintings partly inspired by the surrounding nature and partly by her spirituality. Sometimes she used uncommon materials (Nepalese silk paper, for instance) and uncommon sizes (a banner of 6 meter high). 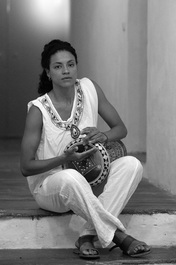 Natalia Perlaza (Colombia) is professional percussionist in New York. She came to participate in a conference of IAC, but at her last evening she granted us a concert on her Egyptian drum. Her musicality and virtuoso impressed all. Later she jammed with Kimberley Trowbridge (voice and guitar) and António Pliz (violin). Kimberley Trowbridge (USA) is first of all a painter. She portrayed herself in the landscape in a style that shows her inspiration by Cezanne as well as the Greek mythology. She also used videos of herself walking in the field, both as base for her paintings and as part of installations. She white-washed a terracotta vase with the shape of an antique Greek amphora then applied as a projection screen for a video showing her dancing as a Greek nymph. Completely new for her were her first steps as a professional singer-songwriter. The try outs were more than impressive. For the future she intends to work more with mixed-media. James Westwater (USA) showed an old moped as a prominent piece of art in one of the waiting rooms of the abandoned train station of Evoramonte. Herewith he celebrated his youth memories but he also referred to art galleries as being surrealistic places. In “his” gallery Kimberley Trowbridge danced a highly sensual improvisation. But the main reason for James to have a residency was PEGASUS: an exhibition in the Castle of Évoramonte. It generally got positive and pleasing responses from the visitors. James was longing for this exhibition since his residency in 2013. He showed a series of floor mosaics of found objects and his master piece: a rearing rusty moped with white cardboard wings. The show needed a lot of preparation, also by OBRAS. But due to its original content and because of the location the result was spectacular. James created enriching confusion at the visitors and other artists. By not telling whether his art work aims at something he forced any-one to have an opinion. These ranged from “over-pretentious”, via “a sensitive citation of Joseph Beusch”, to “a road map to an unknown world”. This scala of opinions also applied to the winged moped: from “a scrapped lunapark toy”, via “the out-of-context setting makes it esthetic”, to “an installation that connects fantasy and reality, antique and recent history, beauty and ugliness" and "it may be a metaphor for a common human frustration: is this all there is? The horse can fly but is caged in a space from which it cannot escape”. Inspired by the murals of Addoley Dzegede (2014) and Luc van der Velde (2010) in the abandoned railway station of Evoramonte, Dena Kahan (Australia) added a beautiful floral motive on a rotten wall: a high fascinating combination. Later she made murals in the corridor and the main house, a niche in the patio and on the wall of her studio. 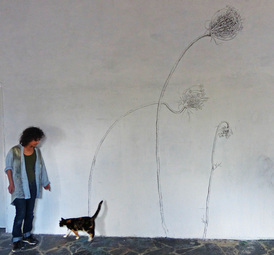 She experimented with oversized presentations: a dried flower of 15 cm became 2,5 meters high and a dead sparrow was 1 m in her mural. Victoria Cattoni (Singapore) came back for the third time. She made 11 abstract paintings in the delicate colors and brush strokes that are so typical for her style. In the same time sensitive, vulnerable, airy and powerful. She worked very focused: she described her residency as very “inspiring, surprising, nourishing, productive and learning”. Phil Moody (USA) experimented with the Camara Obscura technique. Apart from a small hole he darkened his studio completely and then made photos of people sitting in the studio. This resulted in portraits of persons with the landscape upside down in the background. Two realities mixed: highly intriguing. In addition he showed a 2x2m mosaic made up out of 400 9x9 cm photos, all together depicting the past and present of home-industry of textile in South Carolina. He intends making similar mosaics and hopes to exhibit these in Évora. Marge Loudon (USA) made a large series of collages. She paints abstract forms on thin paper, cuts these forms out (mostly amorphous, sometimes geometrical) and then glues it on a base. Only after careful looking it is visible that the "painting" is made up out of hundreds of paper patches. Sometimes the image suggested an element in the landscape, a street view or a still life, but nearly always it triggered a certain mood at the viewer: positive, lively, dreamy, sad and so on. Naomi Sachs (USA) came mainly to see PEGASUS, the exhibition of her partner: James Westwater. She nevertheless gave a short presentation on her scientific background: Healing Gardens. She also visited a home for deeply disabled children, where she contemplated with the director: Nadia Marques and with Antonio Pliz, landscape architect, on options for a garden that helps improving the health and quality of life of the patients. 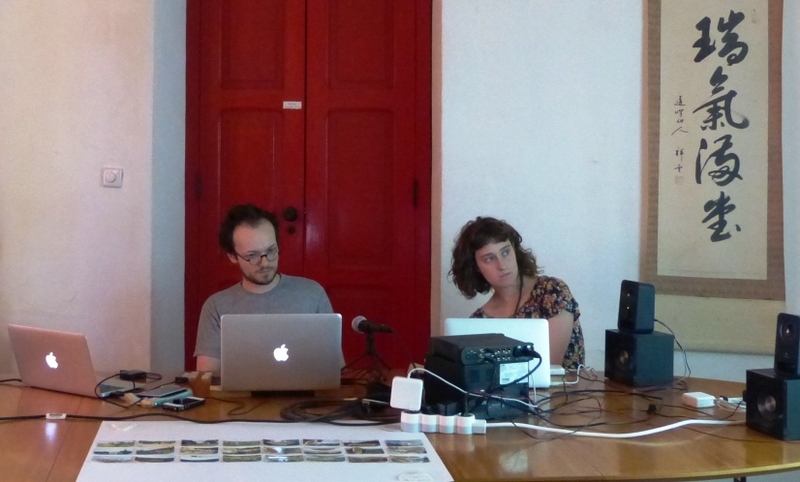 Julian Silverman (Australia) came to investigate traces of Jewish communities in Portugal. With his background of social worker, his experience with minorities and his Jewish roots he is doing an in-depth analysis on a global scale. One of his focuses is on co-existence with other cultures in past and present. In past centuries co-existence with Islamic communities was much less problematic than with Christians. Portuguese history is a showcase for this observation. The present of Portugal is interesting as well: the government officially apologized for what its rulers did to Jews five centuries ago. And they now grant residence permits to all Jews who can prove that they have ancestors in Portugal. Julian is also considering the future of isolated Jewish mini-communities: are they a relic of the past that will disappear within one or two generations? Or are they nuclei that will grow due to globalization, new communicative tools and new ways of co-existence? Elise Valmorbida (Australian, grown up in Italy, currently working in London) had a short but intensive residency. She was editing a nearly finished short story and writing another one. Ariella van Luyn (Australia) was working on the finishing touch of the novel that she started at her residency last year. Her novel has already been accepted for publication. In the same time she worked on the outline of the next novel, in which her daily experiences at OBRAS will feature, such as saving the life of a pregnant sheep and her feelings when she was visiting megalithic monuments. Andrea Hasselager (Denmark) is writer and game designer by profession. But she came to Evoramonte for a special project. From her grandparents she got an envelope with letters that they wrote to each other in the first years of the Second World War. Andrea was allowed to open this envelope only after their decease. She decided to do this in Portugal and to record this opening and her first impressions on video. She choose locations that suggest history, timelessness and longing: the Castle of Evoramonte, pristine nature, an old-men’s café and a cemetery in Estremoz and some more. Sarah Arnold (France) came to write a proposal for a new movie, based on the story of a soldier who tries to compensate his terrifying war experience by fantasizing on beauty. She also screened her latest movie for the residents: Totems. All were impressed and were triggered to have a long in-depth discussion. Later that week the movie was presented at INDILisboa, a prestigious film festival in Lisbon. 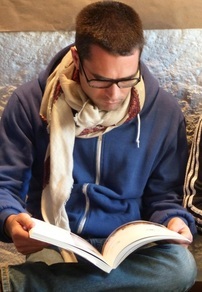 Francis Tabouret (France) did the final editing of his latest novel. He describes his experience as an animal caretaker on a container ship that goes from France to the West Indies. Some containers are for livestock: horses, cattle and sheep. The travel takes about two weeks. He contemplates on global trading, living and working on a limited surface, and on traveling. He considers that just the ship is moving: his space is the same everyday and his life is strictly scheduled and highly predictable. He surprised himself by deciding to stay on the ship for one more day after having harbored. Danny Greenfield-Campoverde (USA) was working on an exhibition in New York in September 2015. With Indian ink he drew delicate, surrealistic scenes on marble shards, which he later assembled as a mosaic. The composition reminds to an archaeological find while the image looks like an architectural sketch, which makes the whole highly intriguing. Ivan Farmer (USA) had a residency at OBRAS Holland. He made half abstract paintings that sometimes suggest paradisiacal landscapes and other times street maps. He included “found images”: a pattern in floor tiles of the corridor, a brand mark of the local broker, a street sign symbol and so on. 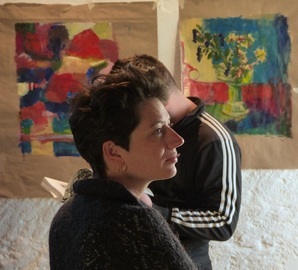 Ingrid Simons (Holland) returned for the sixth time, partly for to make paintings in mega-sizes that she can not make at home and partly for two exhibitions. In "O azul do Alentejo sob o meu olhar" Ingrid showed ceramic works (Museu do Artesanato e do Design, Evora). 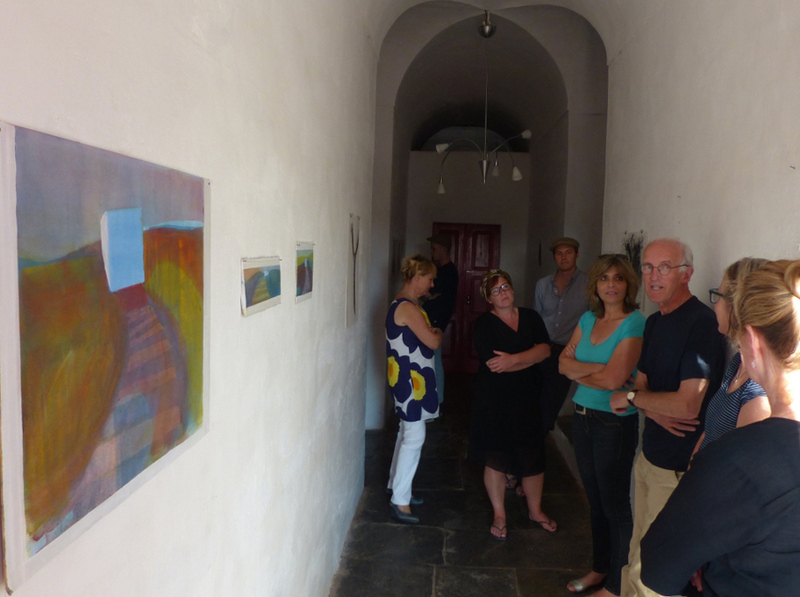 "Raios de Luz" was an exhibition in the municipal museum of Estremoz with paintings and silk screens. 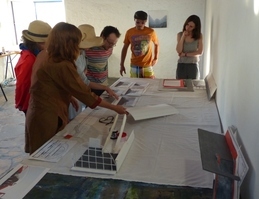 It showed a selection of works that Ingrid made in the past five residencies. These two exhibitions are highlighted on a temporary page. And a Portuguese TV company made a short documentary of her. Sara Tolman (USA) is printmaker and generally makes etches. As we have no press at this moment she decided to make lino prints. She was intrigued by the pigs of the nearby farm. They live in the oak plantations and never see a barn. This may determine their behavior: very lively, shy in first instance but soon mainly curious. Sara´s prints clearly show both the pigs´ behavior and Sara´s fascination. Carolyn Wenning (USA) was one of our first residents in 2015. She was highly inspired by the nearby marble quarries. With charcoal, turpentine and other mediums she made a series of beautiful and intriguing, abstract drawings, based on what she saw and felt. This video clip gives an impression. Erdmute Blach (Germany) showed her “Portuguese” paintings in the Palácio de D. Manuel, Évora Portugal in a grand exhibition: Canções Silenciosas (meaning "Silent Songs"). Erdmute paints in an abstract expressionist style. 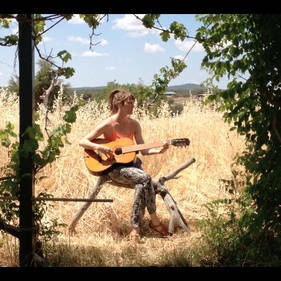 She is inspired by Alentejan songs, the color of cork oaks and silence in the landscape. 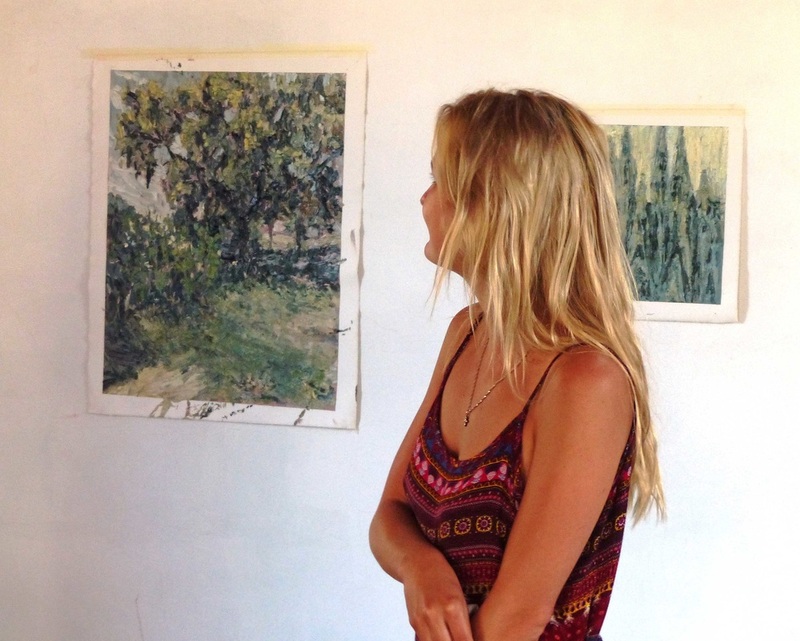 Since 2011 she had artistic residencies in Evoramonte. At the opening on 2 April Mara was singing: she improvised with fados as a starting point. Mara is a highly talented singer and performer, based in Evora, who is giving a new meaning to Alentejan and other Portuguese songs. The video on the right gives an impression of the exhibited works and of the concert by Mara. More information on Erdmute is on her temporary page on this website and on her own site. To make an orchestra, you need six hundred sheep, with bells, each tuned differently. And a hillside now greening. And through it, a light brown twisting trail, just one sheep wide. And scattered about, holm oaks twisted and splayed and giving a dusty shade. To make a real orchestra, one that plays through centuries, you need a Fourteenth Century castle on a hill watching over you and the bones of generations. For an Alentejo one, you need all of this plus the East wind through two-hundred-year-old cork trees and the Rib da Vila’s bright pan of water visible from the height of the farmhouse. But to make an Obras orchestra, you simply need to know that everything is possible in life, in art, and in the promise of a red, yes, really red, maybe vermillion, sunset slipping behind a pig farm. Harald Havsteen (Denmark) was working on his second book: a fictive family novel situated in Iceland, with the key role for a grandfather whose spiritual life is dominated by trolls. Partly surreal and absurd, partly close to real life. For this book Harald developed a kind of hieroglyph script, a personal steno. He ensured the audience at his artist talk that this script is just for economic writing. But all tried to discover what is more behind: reducing content to the essential? a secret? A parallel world? It is still a mystery. Uschi Krempel (Germany) started drawing objects of her apartment, but soon she took the challenge to go big, because, different from her home situation, at OBRAS she had a spacious studio available. 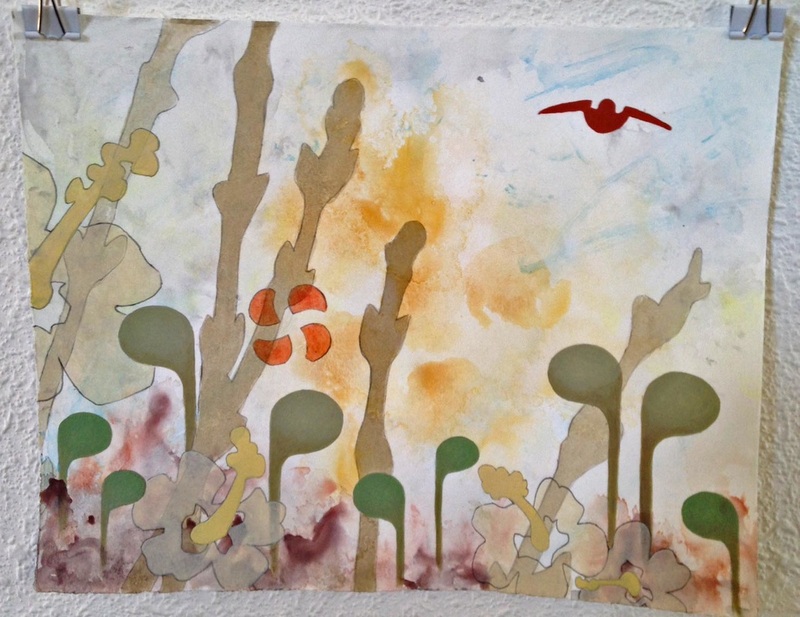 She made two abstract drawings of 1x2m, using local pigments. Although Mia Chaplin (South Africa) is still in her early twenties she is not an emerging artist anymore. Galleries in several countries beg her to be her representative. Her style reminds to impressionists, but her interpretation is very personal. She generally works with pasty brush strokes in a saturated, quite dark color spectrum. 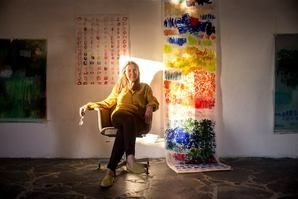 During her residency she started painting in lighter and brighter colours. 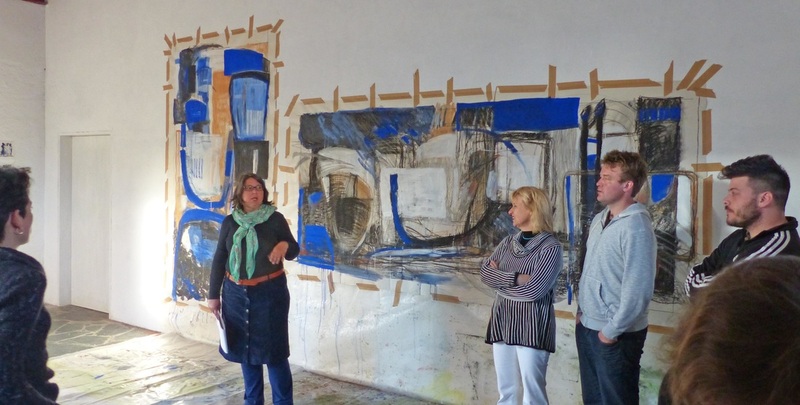 Cody Healey-Conelly (USA) had a residency at OBRAS-Holland. He worked on an animated video for the Band Magnetic Field, and specifically for a song about the Second World War. Apart from 3D computer animation, he used photos, imaginary and videos from WW2 as well as his own illustrations in the style of Egon Schiele. Ana Ortiz (USA) also had a residency at OBRAS Holland. She worked on an ongoing project: a series of what she names: Contemporary disaster paintings. These paintings address the abundance of poor quality images used by the media to portray current events. In her paintings she contemplates on the photographic and abstract qualities of these degraded images.